Vassal States were a number of tributary or vassal states, usually on the periphery of the Ottoman Empire under suzerainty of the Porte, over which direct control was not established, for various reasons. Some of these states served as buffer states between the Ottomans and Christianity in Europe or Shi’ism in Asia. Their number varied over time but notable were the Khanate of Crimea, Wallachia, Moldavia, Transylvania and the Principality of Serbia from 1815 until its full independence half of century later. 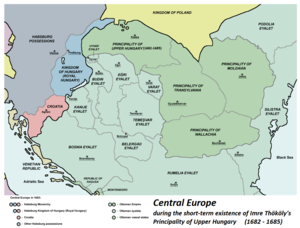 Other states such as Bulgaria, the Eastern Hungarian Kingdom, the Serbian Despotate and the Kingdom of Bosnia were vassals before being absorbed entirely or partially into the Empire. Still others had commercial value such as Imeretia, Mingrelia, Chios, the Duchy of Naxos, and the Republic of Ragusa (Dubrovnik). Areas such as holy cities and Venetian tributary areas of Cyprus and Zante were not fully incorporated either. Finally, some small areas such as Montenegro/Zeta and Mount Lebanon did not merit the effort of conquest and were not fully subordinated to the Empire. Some states within the eyalet system included sancakbeys who were local to their sanjak or who inherited their position (e.g., Samtskhe, some Kurdish sanjaks), areas that were permitted to elect their own leaders (e.g., areas of Albania, Epirus, and Morea (Mani Peninsula was nominally a part of Aegean Islands Province but Maniot beys were tributary vassals of the Porte. )), or de facto independent eyalets (e.g., the Barbaresque 'regencies' Algiers, Tunis, Tripolitania in the Maghreb, and later the Khedivate of Egypt). Outside the eyalet system were states such as Moldavia, Wallachia and Transylvania which paid tribute to the Ottomans and over which the Porte had the right to nominate or depose the ruler, garrison rights, and foreign policy control. They were considered by the Ottomans as part of Dar al-'Ahd, thus they were allowed to preserve their self-rule, and were not under Islamic law, like the empire proper; Ottoman subjects, or Muslims for that matter, were not allowed to settle the land permanently or to build mosques. Some states such as Ragusa paid tribute for the entirety of their territory and recognized Ottoman suzerainty. Others, such as the Sharif of Mecca, recognized Ottoman suzerainty but were subsidized by the Porte. The Ottomans were also expected to protect the Sharifate militarily - as suzerains over Mecca and Medina, the Ottoman sultans were meant to ensure the protection of the Hajj and Umrah pilgrimages and safe passage of pilgrims. The Amir al-Hajj was a military officer appointed by the Sultanate to ensure this. During the nineteenth century, as Ottoman territory receded, several breakaway states from the Ottoman Empire had the status of vassal states (e.g. they paid tribute to the Ottoman Empire), before gaining complete independence. They were however de facto independent, including having their own foreign policy and their own independent military. This was the case with the principalities of Serbia, Romania and Bulgaria. Some states paid tribute for possessions that were legally bound to the Ottoman Empire but not possessed by the Ottomans such as the Habsburgs for parts of Royal Hungary or Venice for Zante. There were also secondary vassals such as the Nogai Horde and the Circassians who were (at least nominally) vassals of the khans of Crimea, or some Berbers and Arabs who paid tribute to the North African beylerbeyis, who were in turn Ottoman vassals themselves. Sultanate of Malacca, (1459-1477) during the reign of Sultan Mansur Shah. Hilaalee dynasty of The Maldives, 1565?-1597? Khedivate of Egypt (Mısır), 1867–1914: de jure under Ottoman suzerainty, in effect fully autonomous, and from 1882 under British occupation; broke away from Ottoman suzerainty upon Ottoman entry into World War I on the side of the Central Powers and reformed as the "Sultanate of Egypt" which was declared a British protectorate on 5 November 1914, the day when Britain and France declared war against the Ottoman Empire. Britain also formally annexed Cyprus (under British administration since the Cyprus Convention in 1878, but nominally still an Ottoman territory) until 5 November 1914. Principality of Bulgaria (Bulgaristan Prensliği), 1878–1908: de facto independent. Eastern Rumelia (Doğu Rumeli), 1878–1885: established by the Treaty of Berlin on 13 July 1878 as an autonomous province; in a personal union with the tributary Principality of Bulgaria on 6 September 1885 but remained de jure under Ottoman suzerainty; annexed by Bulgaria on 5 October 1908. Cyprus (Kıbrıs), 1878–1914: established as a British protectorate under Ottoman suzerainty with the Cyprus Convention of 4 June 1878; annexed by Britain on 5 November 1914, upon Ottoman entry into World War I. ^ Romanian historian Florin Constantiniu points out that, on crossing into Wallachia, foreign travelers used to notice hearing church bells in every village, which were forbidden by Islamic law in the Ottoman empire. Constantiniu, Florin (2006). O istorie sinceră a poporului român [A sincere history of the Romanian people] (IV ed.). Univers Enciclopedic Gold. pp. 115–118. ^ a b Donald Edgar Pitcher (1968). An Historical Geography of the Ottoman Empire: From Earliest Times to the End of the Sixteenth Century. Brill Archive. pp. 139–. GGKEY:4CFA3RCNXRP. ^ "The Tatar Khanate of Crimea". All Empires. Retrieved 9 October 2010. ^ a b Miller, William. The Latins in the Levant: A History of Frankish Greece (1204–1566). London: 1908. ^ Rinn, Louis (1891). Histoire de l'insurrection de 1871 en Algérie. Algiers: Librairie Adolphe Jourdan. p. 11. ^ The European Tributary States of the Ottoman Empire in the Sixteenth and ... - Google Books. Books.google.com. 20 June 2013. Retrieved 18 September 2013. ^ Ismail Hakki Goksoy. Ottoman-Aceh Relations According to the Turkish Sources (PDF). Archived from the original (PDF) on 19 January 2008. Retrieved 10 May 2018. ^ The Thirty Years War: Europe's Tragedy - Peter Hamish Wilson - Google Books. Books.google.com. Retrieved 18 September 2013. ^ Riedlmayer, András, and Victor Ostapchuk. "Bohdan Xmel'nyc'kyj and the Porte: A Document from the Ottoman Archives." Harvard Ukrainian Studies 8.3/4 (1984): 453-73. JSTOR. Harvard Ukrainian Research Institute. Web. ^ "Princes of Transylvania". Tacitus.nu. 30 August 2008. Retrieved 18 September 2013.